Comment Driverless cars will solve congestion. Driverless cars will improve road efficiency; driving along closely behind each other in platoons. 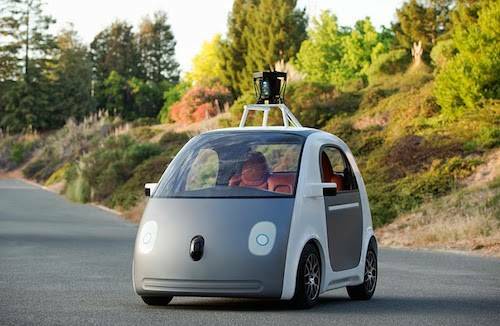 Driverless cars will stop you waiting at the kerb for a taxi. Yeah, yeah; it’s all drivel. The tech is wonderful, gee-whiz-that’s-great stuff, but there’s a few things that are unbelievably unrealistic about the project. A recap first: Google has been trialling a fleet of driverless Lexus SUVs and other vehicles using an array of sensors, such as LIDAR, referencing sensor data with extra-granular street mapping, and interpreting road events using software algorithms so that the vehicles can drive safely and relatively anonymously amongst driven vehicles in both city, urban and rural area. It has also just announced its own prototype G-drive buggy to carry two passengers with no driving controls like accelerator and brake pedals, and steering wheel, etc. We think it will still have cup-holders though. The vehicle will wait one second before starting off when traffic lights turn green, according to this interview with head G-driver Chris Urmson, director of the driverless car project. They’ll also have safety built into the vehicles from the behaviours we’ve learned from the Lexus, things like waiting at a traffic light for a second after the light turns green. We call it defensive driving. We call it blocking the traffic and lowering the number of vehicles that can cross a traffic light-controlled junction. If ten vehicles can cross the junction in a 20-second interval, say, and the first car waits four seconds then only eight vehicles can cross, meaning the junction’s vehicle capacity is reduced and congestion is increased. Still, at least in those conditions the Google cars won’t be on the road (which will reduce congestion)... unless they’re caught in a sudden bout of fog or a rainstorm, in which case their sensors start going blind and they’ll have to stop at the side of the road. This will narrow its width, reduce its vehicle carrying capacity... and add to congestion. We’re told by the G-drive gushers from Mountain View that road trains or platoons of driverless cars will use roads more efficiently because they’ll be able to drive more closely together than human-controlled vehicles. Right. So you’re driving along at 60mph and come across a slower platoon of some twenty vehicles moving at 55mph. You overtake them, noticing there’s no gap between each car in the platoon that’s large enough to let you in, and then you come up to the exit ramp you need to take but can’t get onto it because the platoon prevents you passing though it. Let’s reverse this idea and have a faster-moving platoon come up to a slower moving vehicle which it can overtake; how does that work? Does the whole platoon move sequentially, car by car, into an adjacent lane and overtake the slower vehicle? Twenty of them, one after the other. What does other, faster traffic do when this is happening? Slow down, of course, because the road’s capacity for faster traffic just got reduced. Somebody, somewhere, needs a highway traffic simulator through which these scenarios can be run to see what the actual effects on traffic and road congestion these driverless vehicles will produce. My vision for this is eventually these vehicles will be shared, and it may be within a family, or it may be within a community, and that will result in less vehicles on the road, but they’ll be used much more efficiently, and that’s good for everyone. Where to begin? Imagine a community of fifty people with 40 cars. In any day 30 of them use a car to go somewhere and six of them share the vehicle with one other person. That’s 24 trips and 24 vehicles on the road, which leaves 16 cars parked, either on the side of the road or in yards. Now let’s do it with driverless cars; 24 trips and 24 vehicles on the road with some left parked through not being used. It’s the same number of vehicles on the road, innit? Only it isn’t, it’ll be more – because Google’s saying blind and disabled people who can’t drive will be able to call up and use a Google car. This means more vehicles on the road. The cars use GPS to locate themselves, with more precise location data provided by the LIDAR and other sensors. Sensor input is received and processed, we understand, by a quad-core x86 processor using a modified version of Ubuntu Linux. What happens when the GPS data is unavailable, as with a long tunnel? Does the car get lost? What happens when a traffic incident causes a diversion off the highway, so far off that the car goes off the boundary of its stored map? At that point it becomes lost and doesn’t know where to go, unless it can download a new map. How is that accomplished? By cell phone or Wi-Fi? If either (or both) are unavailable, the car is stranded. How is a car’s map initially loaded? Is it like Google Earth with a network link providing a start location and then a route map loaded once you key in a destination? Or is it like a SatNav system with a whole regional map stored in the vehicle? 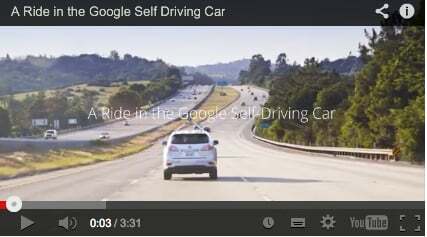 Keen drivers view Google's driverless cars project with some disdain. A taste of this can be found on the Pistonheads website, which describes Google's self-driving buggy video as "crammed with Google sickly sweetness and old people." Amongst the 145 comments was this beauty from user IN5IGHT: "Quite apt that an advert for funeral cost insurance popped up when I watched the video......"
There's a tone of reluctant acceptance, for city driving, with dislike for their use outside cities where Pistonheads readers prefer to fire up "the noisy bumpy manual fossil burner and head to the hills." User Max_Torque said: "Since the autonomous program must ALWAYS act in the safest fashion, you should be able to cut these things up with impunity! ;-)"
Fast-Chas writes: "how would this deal with overtaking a cyclist on a dual carriageway and judging the speed of the WRX hurtling its way towards its arse at 95mph. We might be able to spot the Subaru in our rearview mirror and make a judge call. Will this pull out? I'm guessing it has radar to judge distances etc., but then it'll never be able to overtake anything as most cars will be within the 'allowed proximity'."